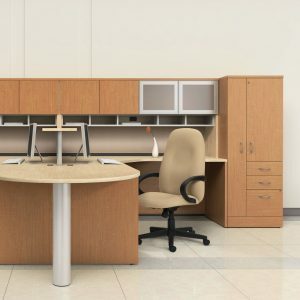 If you’re in need of commercial furnishings for your new office space in or around Sandy Springs, Georgia, turn to the professionals at NorthPoint Office Furniture. We are a locally-owned and -operated office furniture dealer specializing in new and used, high-quality furniture for businesses in the Metro area. Since 1994, we have been providing customers with attractive and durable furniture options at the best value for their money. At NorthPoint Office Furniture, we want to make sure your experience with us is a pleasant one, so we’ll take the time to learn exactly what you want to do with your new office space and will help you find a solution to your needs. So for commercial furnishings to outfit your new or expanding office in the Sandy Springs, GA, area, look to the experts at NorthPoint. In addition to offering premium commercial furnishings, we also provide basic space planning. We’ll go to your new office in the Sandy Springs, GA, area and offer recommendations on how best to fit your new furniture into your space for optimum comfort and efficiency. What’s more, the new furniture we offer is covered by generous manufacturers’ warranties, so you can rest easy knowing your investment is protected. To learn more about the commercial furnishings we offer for businesses in Sandy Springs, GA, and the surrounding communities, call NorthPoint Office Furniture today, or stop by our showroom.